This is the 11th post in the #DITL - Day in the Life of a Teacher Series. My day is day 8. I don't think I have posted on a Monday before. I often live by "Don't put off until tomorrow what you can do today." This is clear with Mondays. I do things on Sunday to help my Monday. I boil 10 eggs to take for the week. I made some tuna to take. I make my grocery list because I shop on Mondays. I usually do some sort of grading. No matter how much school work I do on the weekend and how prepared I feel for Monday, I come in on Monday morning and there is so much more to do! I am here now, at 6:51 am, getting ready. I am in good shape. I put the desks back in order, put the schedule on the board. I have a poster of birthdays that I update each week. There are three to recognize this week - no big fanfare, just a "Happy Birthday" - one of my #TMC16 things. Last May I took part in a blogging challenge to blog every day. I almost did it. There may have been one day that slipped by. I keep reminding myself I need to go back and look (off to look for a few minutes). I missed more than just one. I missed 6. Here is my monthly post about it. I need to spend more time going back and reading that. I titled this one "May Milestones" because it is a busy month for us. I remember knowing this last spring and here we are. My youngest made his Confirmation this past Saturday so we had a cookout. My mom comes in from Florida for a month starting this Wednesday. Prom is Friday. I will help out a little but my own kids aren't going. My second son graduates from UMASS Dartmouth with a degree in Electrical Engineering on Saturday. We will take him out to dinner. Sunday is Mother's Day and I will be hosting my family. I need to figure that one out. May 20th is my youngest's 16th birthday. We won't do another party for him, probably just take him to dinner. And, then begin the high school senior festivities for my third son with parent/student dinner, boat cruise, cookout, awards night, and finally graduation on Friday, June 2nd. We will have a party for him on June 3rd. Then, I will be able to breathe. I am feeling like my juniors who are taking AP Exams and getting ready for Prom - a lot overwhelmed. I have a lot of lists going and overlooked the due date for the parent/student dinner. It slipped through the cracks. But, I was able to email and still get in even though I missed the due date. I am trying not to let grading get too piled up. I finally graded my Alg 2 conics projects I have had for a while. That is a big relief. I graded assignment sheet 18 yesterday. The students get through AS 20, so those will be done soon. I have the catapult project to grade, but those were done in groups, so not too many of them. I try to remember to breathe. I still workout every day to keep my sanity and to fulfill my #fitbos goal. I am on track with that. 2nd block is Acc Alg 2 - a class that is a mix of juniors and sophomores. The sophomores have their AP bio test today so half the class will be gone. I have a quiz planned for Thursday on trig identities, so they will get their review material today and the sophomores got it on Friday. It is tough juggling AP exams and states exams plus Prom and Relay for Life. 4th block is Foundations of Alg 1 - we have been graphing quadratics from vertex and standard form. The kids are doing really well with it. They will have a quiz on Thursday. I made a really great quiz (I think) We start each class with an Estimation 180, a Visual Pattern, and a Splat so the Visual Pattern and Splat made it on the quiz. Here is the quiz if you want to see it. Today we will play on desmos with polygraph and marbleslides. I'm looking forward to seeing how they do. Let the day begin....A student came in early for 1st period with a question about last week's @desmos marbleslides - graphing rationals. He had one star up high and three below in a horizontal line. It was a challenge question he had been working on because he was still puzzled. I loved that he was still looking at it. I did not assign it as homework. He just wanted to figure it out. And, we did together - success by 7:20 am! My colleague @kd5campbell came in to remind me we need to book our airfare for #TMC17. We have our hotel booked, just need the airfare. 1st block went well. We are multiplying and dividing rational expressions. I gave them a problem and they are still cancelling terms. I plug integers into a fraction and show them how it works. I tell them they can only reduce factors not terms. We will keep working on this. 2nd block is now. My juniors are diligently working on trig identities while I update my canvas site. I realized I didn't put my new calendar for this last unit up and I linked to the answer key for the review they are working on. They finished this review pretty fast, so now I have plans for my next period prep - get them some more practice for tomorrow's class. 3rd block prep - answer some emails. I found this trig id sort I have seen before but not used. I will try it tomorrow. I typed up 6 new board problems - a mix of trig. 4th block - long block - Foundations Alg 1 - Only 5 out of 7 kids. It is hard to get 5 kids going but Desmos Polygraph and Marbleslides will do it. They figured out the yes or no questions and used some good vocabulary on the Polygraph. One girl even asked "does your graph have 2 x-intercepts?" We moved onto Marbleslides which is quite challenging. We have talked about limiting x but they figured it out. It is allowing them to see the need to make a graph fatter or skinnier. After lunch, I have this same class for 20 more minutes so we did @mathycathy's activity of creating a quadratic graph paper chain found here. It went well. I had the kids work in groups which was only 2 groups, so I was able to help one group and then the other. I think they will be in good shape for their quiz on Thursday. 2 pm - after school meeting - We are getting new teacher computers next year. We have to back up everything for the transfer. I need to add this to my To-Do list. We are discussing next year's courses and budgets. It's that time of year. 3 pm off to grocery shop, home by 5 pm, just like planned, make yummy fish for dinner. Check school email and see my summer curriculum proposal was accepted to do work on teaching Geometry. I have taught it before but not at the Accelerated level, so I am excited to come up with new ideas and activities. I might put together something on Twitter. 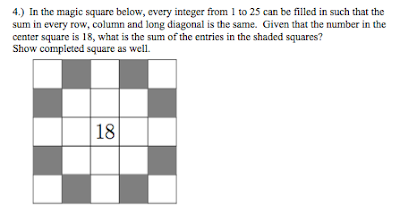 I saw someone did for an 8th grade PLN and it looks like we have some teachers new to Geometry next year. Add this to my to do list. 6 pm - my sophomore is taking Geometry and has a quiz on circles tomorrow and actually asked for help. He usually doesn't, so we worked together. Write a few graduation invitations. I must get these done and in the mail tomorrow. Search for my phone. Find my phone. Off to tap. I have always wanted to take tap dancing and a class was offered here in town starting in January. I signed up and loved it. Just Monday nights, all adults. This is the 2nd class of the 2nd session. It is hard! I love learning new things though. There were only 2 of us so we got a lot of steps in. Home to watch TV and chill out for a while as I check twitter and facebook on my phone. I also looked at how far apart the TMC17 hotel is from the School and it looks like 2 miles. Not too bad. 9 pm and time for bed. Decisions - I needed to decide what to do for more trig practice tomorrow because my kids visited the work in class today. A good teacher move today was helping my Foundations kids do the Quadratic graphing chain. Because there were so few kids, I could work with each group individually and ask them questions to move their thinking forward. I don't think there was anything not ideal today. Highs - it is a super busy time of year. I have so much going on in my regular life as well. I am trying to find balance. I am trying to be in the moment and to be present during all these great things. I am looking forward to one son graduating from college on Saturday and one son graduating from high school on June 2nd. I can't believe it. The college years have flown by. The high school years have felt like 100 years long and we have finally arrived. I will be a crying mess at hs graduation. A challenge lately is money. Given it is a busy time also means a lot of things involve money, money, money. I hate worrying about money but when you don't have money in the account to pay things, then it is time to worry. It is also frustrating that no matter how long I work, no matter how hard I work, no matter how good I am at the job, the paycheck is still the same. And, some how it doesn't stretch. Some how hopefully all these things will get paid. About a relationship, I will talk about fishing club. There are three new boys in fishing club. One, whom I have not had as a student. He reminds me of Huck Finn. He has all his fishing gear and he knows what he is doing. He is also willing and able to help the other newbies. The second boy has ocean fished but never freshwater fished. And, the third boy has never fished before ever. These last two I have had in class. It is nice to get to know them outside the classroom. I think they love to have someone to talk to for two hours. Boy, can they talk. They are also learning about how to tie a hook on, how to put a worm on, and we did have a good size catch last week, so how to take the fish off the hook. My focus for the year has been working on vertical non-permanent whiteboards #vnps. I presented at a conference at the end of April. We only had 15 minutes to present. I will be presenting on it at TMC for an hour, so it was a great little practice. I am still doing it in the classroom. It is great to use with trig identities. The groups of 3 only have 1 marker and work through verifying trig identities. There have been great discussions and it is good for students to see how others might do the problem. Inverse Variation - What do you notice?